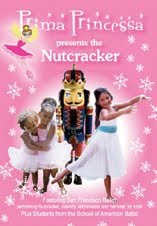 This past week several Nutcracker performances took place in our area. On Christmas Eve our local PBS station is airing Dance in America: San Francisco Ballet's Nutcracker. The Nutcracker ballet was first performed in its entirety in the United States on December 24th, 1944 by the San Francisco Ballet. This famous ballet is now an annual Christmas season tradition and productions can be seen all over the nation, in large and small venues. As I've said before, my preschool age daughter takes beginner ballet lessons. She wears her hair in a bun, has a pink leotard and tutu and, of course, has her own special pink ballet slippers. If she continues to show an interest in ballet, someday she may be able to perform in the local Nutcracker production. However, right now she enjoys pretending to be a prima ballerina and likes to dance along with the performers on television while watching her newest favorite DVD, Prima Princessa Presents The Nutcracker. The Prima Princessa Presents series is perfect for children ages 3 to 7. The DVDs bring ballet performances right into your home. Children can watch and dance along with the performers and they even get the chance to learn real ballet steps. Arm Positions and Port de Bras shows the four basic arm position in classical ballet, along with visual images of flowers blooming. In the other segment, a Holiday Party set to the "Dance of the Sugar Plum Fairy" music depicts children decorating cookies, eating other yummy Christmas treats and handing out gifts. Young children that love princesses, ballerinas, ballet or the story of the Nutcracker will especially enjoy watching the DVD. The divided segments are short enough for small attention spans. Even my toddler son enjoys watching parts of the film and trys to follow along with the dances. (Yes, there are a couple of parts in the film where boys are featured dancing, fighting with swords and pretending along with the girls!) My daughter's favorite scenes include the leaping Russian dancers, the rolling bear, and the Sugar Plum Fairy and the Waltz of the Flowers. The video is a perfect way to introduce young children to The Nutcracker ballet and it encourages participation by getting kids off the couch to dance along. Now the only question I have is where can I find one of those large lollipops? oh how I love the nutcracker..